Argentinian-born Italy Test tight-head Martin Castrogiovanni has established him as one of the world's premier props and has become a firm fan favourite at Welford Road for his club side Leicester Tigers. Formerly an Argentina Under-19 and Under-21 international, he played his early rugby with Atletico Estudiantes in Argentina before moving to Italian side Calvisano in 2001. He spent five years with them before being snapped up by the Leicester Tigers in 2006. He made an immediate impact in English rugby's top flight and was named Guinness Premiership Player of the Year at the end of his debut season - in the process becoming the first prop and Italian to scoop the honour. An ever-present with Italy in two Rugby World Cups, he made his international debut against New Zealand in 2002 and notched up his 50th Test cap during the Six Nations in 2008. He scored a hat-trick of tries against Japan in 2004 and was the Azzurri's top try-scorer in the 2008 Six Nations with three scores. On the domestic stage, he acquired cult status at Welford Road and a reputation as one of the league's most fearsome props. 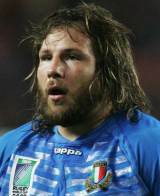 Castrogiovanni played a key role in the Tigers' dominance of the England domestic scene in the naughties helping them to Premiership titles in 2007, 2009 and 2010. His sharp rise in stature led to him being increasingly linked with big-money moves abroad. But despite reports linking him with a move to Top 14 giants Stade Francais in 2011, Castrogiovanni signed a new contract with the Tigers. But while he was Italy's undisputed first-choice tight-head, at the Tigers he found himself increasingly behind England tight-head Dan Cole in their pecking order as shown by the fact that he was forced to start the 2011-12 Premiership final from the bench. At the end of the 2012-13 season he announced he would join Toulon but he marked his final campaign at the Tigers with an Aviva Premiership title.